We have the perfect Mother’s Day dessert! You will love this Blueberry Jamboree. It’s from a delicious bakery that first opened in 1996 on a quiet street corner in the heart of New York City’s West Village. It’s called Magnolia Bakery. They now have one in Los Angeles close to our sister Stephanie. She has had their delicious macaroons. We had this blueberry jamboree at a recent family party and it was a hit. It’s a pecan shortbread crust layered with real whipped cream and a cream cheese filling, and topped off with a fresh blueberry topping. Happy Mother’s Day! 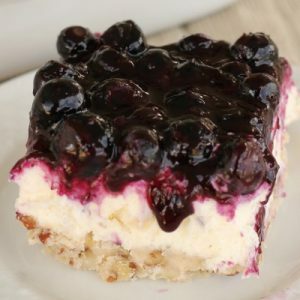 A delicious pecan shortbread crust layered with whipped cream and cream cheese filling, and topped off with a fresh blueberry topping. In a large pan combine 1 1/2 cups blueberries, sugar, and brown sugar. Cook over medium high heat and stir constantly. Stir until sugar is combined and blueberries start to pop and come to a boil. Dissolve cornstarch in water. Add the cornstarch/water mixture in the pan with the blueberries and stir until the mixture becomes thick. After it has thickened, remove from heat and add the remaining 2 cups of blueberries, then add in the lemon zest and stir in gently. Cool to room temp or refrigerate until ready to use. Grease a 9x13 inch glass pan. For the crust, melt the butter and stir in the flour and pecans. Press crust evenly into the bottom of the prepared pan. Cook at 325 for about 15 minutes or until lightly browned. Then let crust cool to room temperature. For the filling, whip the heavy cream and set aside. In another mixing bowl beat the cream cheese and powdered sugar together until smooth. Then add the whipped cream in with the cream cheese mixture and combine. Then spread over the cooled crust. Spread the blueberry topping over all. Let set in the fridge for about an hour. this dessert did not set up for me, it was very runny...? thoughts? Hi Julia, I'm not sure what layer was runny. I'm thinking maybe the cream cheese layer. Did you whip the heavy cream first until thick and set? After whipping thick you set aside and combine the cream cheese and powdered sugar until blended, then add in the heavy cream that has already been whipped. The blueberry topping was quite thick too. I hope this helps. It really is a dessert that sets up well. Sorry you had a problem with it. Can cool wip be used in place of heavy sipping cream? Hi Laurie. We haven't tried using Cool Whip with this recipe so not sure how it would all turn out. We have other recipes that have cool whip mixed with powdered sugar and cream cheese. So I'm thinking it would work out ok. Let us know if you give it a try. Have a great week!! Found your recipe on Pinterest while searching blueberry desserts. My daughter made this for my birthday. We liked it very much. My husband loved the pecan crust, the grandkids not so much. We will make it again with a graham cracker crust for the children. We will also double the blueberry sauce to serve extra on the side. Thanks! I have been searching for this for a while...thank you six sisters....this was amazing!!!! I added blackberry ' s to mine and it was even better. Thanks for this wonderful desert. Made this for 4th of July, it was so easy and delicious! I subbed the heavy cream/whipped cream for truwhip, it was tasty. Thank you for sharing! Considering this dessert but would need to make previous night....is this better when served an hour after making or is it just as good when it’s set over night?